Thematic maps have become a primary mechanism for summarising and communicating the increased volumes of geographically related information. This blog post is a short summary of the most common thematic mapping techniques. 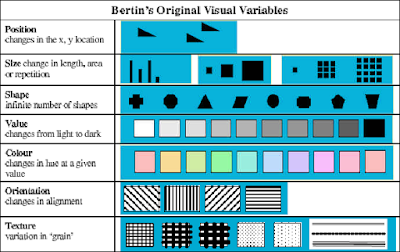 Jaques Bertin (1967) established a graphic system of visual variables, which represents an universally recognized theory of the cartographic transcription of geographical information (Koch, 2001). Visual variables describe the perceived differences in map symbols that are used to represent geographical phenomena (Slocum et al., 2005). Bertin’s system has been subsequently modified by various cartographers, and the visual variables presented below are based on Slocum et al. (2007), which add 3-D symbolisation. A point symbol refer to a particular location in space, and is used when the geographical phenomena being mapped is located at a place or is aggregated to a given location (MacEachren, 1979). Differentiation among point symbols is achieved by using visual variables, like size, colour and shape. Common thematic mapping techniques using point symbols are dot maps and proportional symbol maps. On a dot map one dot represents a unit of some phenomena, and dots are placed at locations where the phenomenon is likely to occur (Slocum et al., 2005). A proportional symbol map is constructed by scaling symbols in proportion to the magnitude of data occurring at point locations. These locations can be true points or conceptual points, such as the centre of a country for which the data have been collected. Line symbols are used to indicate connectivity or flow, equal values along a line and boundaries between unlike areas (MacEachren, 1979). Line symbols are differentiated on the basis of their form (e.g. solid line versus dotted line), colour and width. Common thematic mapping techniques using line symbols are flow maps and isarithmic maps. Flow maps utilise lines of differing width to depict the movement of phenomena between geographical locations (Slocum et al., 2005). Isarithmic maps depict smooth continuous phenomena, like rainfall or barometric pressure (Slocum etal., 2005). Area symbols are used to assign a characteristic or value to a whole area on a map. Visual variables used for area symbols are colour, texture and perspective height (Slocum et al., 2005). The choropleth map is probably the most commonly employed method of thematic mapping, and is used to portray data collected for enumeration units, such as countries or statistical reporting units. While choropleth maps reflect the structure of data collection units, dasymetric maps assume areas of relative homogeneity, separated by zones of abrupt change. The country statistics used in the Thematic Mapping Engine can be considered as areal phenomena, because the statistical values are associated with political units specified as enclosed regions. Volume symbols can be considered as 2½-D or true 3-D (Slocum et al. 2005). The first can be thought of as a surface, in which a geographical location is defined by x and y coordinate pairs and the value of the phenomenon is the height above a zero point. An example is prism maps which uses perspective height as the visual variable. 3-D symbols can be used to represent true 3-D phenomena, like the concentration of carbon dioxide (CO2) in the atmosphere or geological material underneath the earth’s surface (Slocum et al., 2005). I'm interested in how these techniques can be represented in KML. You'll find several examples on this site. Please provide other examples by adding a comment. Especially, I would like to see examples of dot maps, flow maps, isarithmic maps and dasymetric maps in KML. Slocum, T. A., McMaster, R. B., Kessler, F. C., Howard, H. H., 2005, "Thematic Cartography and Geographic Visualization", Second Edition, Person Education Inc.